I don’t know about you but for many years in the breakfast cereal stakes, I have to say I have been a cornflakes man. I have in the past, on and off dabbled with weetabix, but over recent years I have been banned from going near those golden bricks of breakfast, for various reasons. Over the last few weeks there has been a significant change around here in my morning munching regime. After 53 years of running scared, I have eventually come to see the light and been truly converted to PORRIDGE! Now, in the past, I could never understand why Goldilocks would go near the stuff, but somehow I am hooked in a big way to that bowl of oaty gorgeousness. What is really hard to take in all of this is the fact that for years growing up, I would do anything to steer clear of the stuff and would on many occasions come home from a long hard day in school to find the porridge I hadn’t eaten at breakfast time, staring at me excitedly from the table, awaiting my return at tea time. Oh, how my Mother would torture us with that porridge, but now it’s a complete turn around. Once I get all my animal feeding and organising out of the way, I get myself back into the house for my breakfast ritual. Here’s how it goes. I get my special measuring mug out and put one mug full of oats into a pan, add two mugs of water, and a dash of salt, but never ever, sugar, treacle, jam or other such girly additions should be entertained. Slowly and ever so carefully I bring it to the boil and once those bubbles of air are struggling to force their way through the porridge it’s time to put it into a bowl. This is where it starts getting technical as it has to be a stone cold, china bowl and will be left to cool down. I have found that the time it takes for me to relight our old bosky coal burner is just sufficient time to get to temperature. On a side note, I could never really understand why the 3 bears would go out and leave their porridge to cool down, allowing Goldilocks to come and have a nibble, but I do now. Once my porridge has cooled to the correct temperature, that’s when I slowly pour, very cold, straight from the fridge milk, around the edge of the bowl, then pause for just a moment before carefully giving the bowl a little twist and shake. 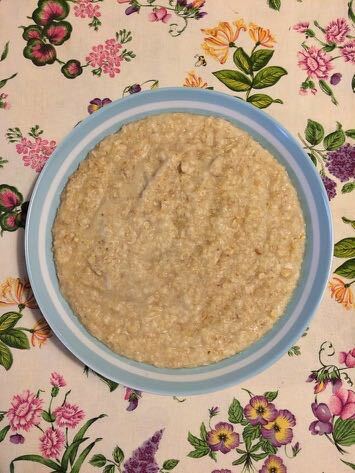 If all has gone to plan, the milk has sneaked under the porridge and my breakfast is now floating merrily and looking as appetising as any bowl of porridge ever could! Anyway onto other things. When we lived in town, it’s funny, but the local squirrels, as beautiful as they might be, never really endeared themselves to me very much. It was probably because within a month of moving in they had stripped out the roof lining of our lovely new double garage, presumably they were using it to line the inside of their drey. So, in short we never really had a good relationship back in suburbia, but that’s changed out here. We have a couple of squirrel families and I can’t believe how industrious they are, scurrying up through the trees, with acorns and cob nuts and carefully burying them in the ground to store them away in readiness for the winter. Maybe we can all learn a thing or two from those squirrels.